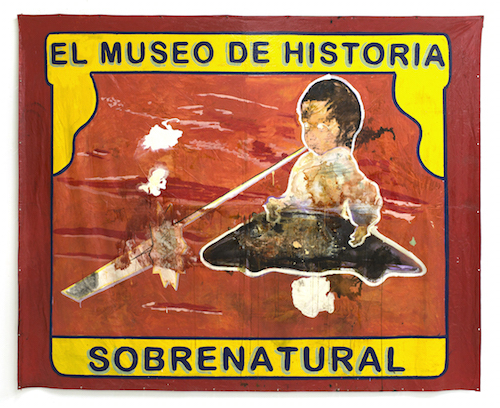 José Luis Vargas, The Museum of Supernatural History, 2015, mixed media on tarp, 10' 21“ x 9' 6”. José Luis Vargas has stated in relation to the current state of his native Puerto Rico, “In mythology, monsters rise when there’s a crisis. This may be the worst crisis in every respect on the island, and yet it’s also the most critical time for creativity to arise.” This exhibition manifests the artist’s urgent call for the country to slay the dragons of its past and reinvent its stalled, collective imagination. Remembering versus forgetting; science fiction, colonialism, and a discourse revolving around the theory of the other are at the heart of Vargas’s creative enterprise. To wit, Vargas’s seven large painted tarps and unstretched canvases displayed here have bold graphics, drips, stains, and well-worn creases that suggest carnival freak-show advertisements. Come and see El Museo de Historia Sobrenatural (The Museum of Supernatural History) (all works cited, 2015), where La niña, a phantom nomad, hovers in a UFO. Step up and observe a monster with the head of Gandhi, crooning never-ending refrains in El Último Monstruo (The Last Monster). In these backdrops, Vargas synthesizes a space between trauma and humor. Elsewhere, the painting Exquisite Corpse depicts an autopsy of two Puerto Rican legends—the top half is Pedro Albizu Campos, the leading figure of the national independence movement, and the bottom half is a Garadiablo, an amphibious creature allegedly discovered in the 1970s. The mutant monster’s face and lower body have an aqueous outline and appear to be dissolving. Meanwhile, another painting, titled Crown, gives us hope by way of a cross-cultural menagerie of supernatural heroes that look down on the viewer from the top of a royal palm. It suggests that here the individual viewer, the community of the nation at large, and the land can join together to create a new history.